All transactions are safe and secure with a reliable history in online purchasing behind each of our associates. Buy The "It's Just a Flesh Wound" Game t-shirt to own Monty Python clothing and merchandise. This fun Monty Python and the Holy Grail It's Just a Flesh Wound tee features an Operation board game style image of the Black Knight on the front. It was inspired by his fight with King Arthur where he refuses to give up, telling Arthur, "It's just a flesh would..." The popular and often repeated Black Knight movie quote appears in red font on the front of this Monty Python t-shirt. Wear it so that your enemies know that you won't back down during a confrontation, even after complete dismemberment. 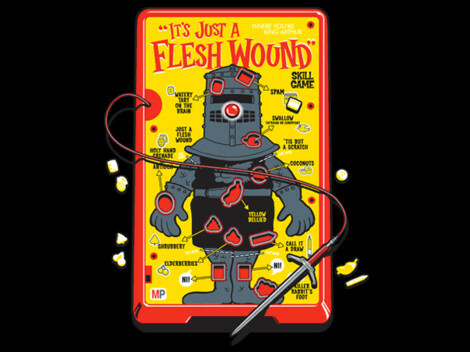 In addition to The "It's Just a Flesh Wound" Game tee above, browse the Monty Python Clothing Gallery for more apparel like men's and women's clothes, kids shirts or hoodies.